The tour runs all year round but the caves are a great way to fill a rainy day. We are comparing The Caves of Drach and Mallorca's East Full-Day Tour Prices from leading ticket suppliers and Try to find you Cheap tickets prices on the market. The four caves, which are around 25 metres deep and 4 kilometers in length each, are named Black Cave, White Cave, Cave of Luis Salvador and the Cave of the French. All four caves are connected to each other and were formed by the Mediterranean Sea rushing through the holes in the rocks. They’re one of the main attractions and many tourists visit over the course of the year. The caves have fantastic acoustics so after you’ve enjoyed a boat ride across the lake, you’ll enjoy a short classical music concert. Porto Cristo is home to some fantastic family-run restaurants, quaint gift shops and weekend market stalls. Use your free time to get a taste for the local culture and to soak up the Mediterranean atmosphere. Your Experience With The Caves of Drach and Mallorca's East Full-Day Tour? Enjoy a classical music performance on one of Europe’s largest underground lakes. The caves acoustic make for a sensational concert hall. Mediterranean lunch in Porto Cristo. After, use your free time to explore the town itself or relax on the beach. On your way back to Palma you’ll stop at the famous Mallorca Pearl Shop. 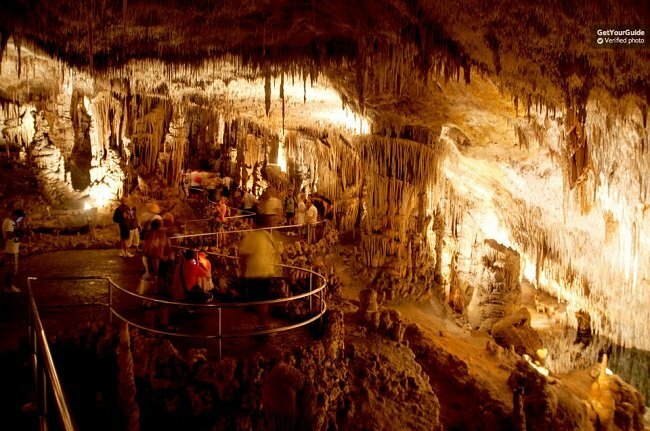 What The Caves of Drach and Mallorca's East Full-Day Tour Includes? Wear comfortable shoes, especially for climbing the 300 cave steps. Travelers Reviews about The Caves of Drach and Mallorca's East Full-Day Tour? There are lots of steps inside the cave so you must have a reasonable level of fitness. Pick-up points vary depending on month, please check with your tour guide before the departure. Meeting point: Estacion Maritima No.2 or Escuela Nautica.